As #IndieHero month here at Indies Unlimited comes to a close, I wanted to take a moment to shine the light on some of my Indie Heroes – the ones here at IU. You see their articles every month – which you read for FREE. They sometimes have to work at finding a topic – like writing a book, ideas don’t always come that easily. Then, when they have to, they research them, write them, create the SEO information to go with them (yes, you ALL should be doing that each time you write a blog post – or who will see your stuff? ), find a matching image, and then send them over to me by the deadline. That’s right, they do all this for free. Because they are super cool people, exemplars of the indie spirit. 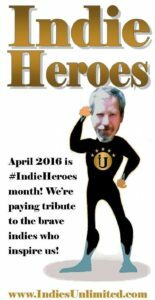 Indie heroes come in all shapes and sizes; some are authors and editors, and some are book reviewers. This particular book reviewer is an inspiration to many, and has become a a much appreciated fixture here at Indies Unlimited. Of course, we are talking about BigAl, avid Indie supporter and the head honcho over at BigAl’s Books & Pals and The IndieView. Mild-mannered church organist and accountant, Sable Hunter always had a vivid imagination. When she began writing her stories of cowboy and fair maiden fantasies she discovered she had a talent – an exceptional talent. This talent has helped her sell tons of books, develop an insanely protective group of readers, as well as see her ostracized from the community she served every Sunday. Sable Hunter just “does it”. She sets her goals and gets them done with no excuses. Sable is one of my Indie heroes. Here’s a rare glimpse into Sable’s life.